"The refined techniques of movement — lightning-quick ducking and side-stepping — were unknown. That all really didn't start until Dempsey." — Max Schmeling on Jack Dempsey's influence. William Harrison Dempsey's boxing career began when he left his Colorado home as a hobo at age 16. In the ring, he fought colorfully named opponents like "One-Punch Hancock" and "Chief Geronimo." Dempsey himself was known as "Kid Blackie" and later as Jack. Jack Dempsey's boxing style consisted of constantly bobbing and weaving. His attacks were furious and sustained. Behind it all was rage. His aggressive behavior prompted a rule that boxers had to retreat to a neutral corner and give opponents who had been knocked down a chance to get up. In his 80 fights, Dempsey knocked out 49 men, 25 of them in the first round and one after only 14 seconds. The public loved Dempsey's raw toughness. On July 4, 1919, in 100-degree heat, Dempsey faced Jess Willard, the man who had taken the world heavyweight title from Jack Johnson. Dempsey knocked Willard down seven times in the first round, and after three rounds the fight was over. 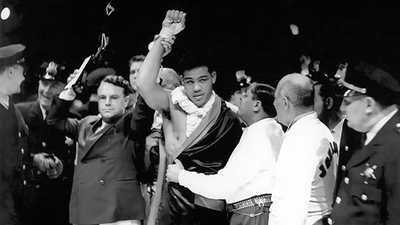 Jack Dempsey was the new world champion. Promoters played up Dempsey as a rough character. Stories of Dempsey's lawlessness circulated: he was said to have dodged the draft and to beat his wife. His battered face certainly looked menacing. When he fought an elegant Frenchman, Georges Carpentier, the contrast between the men helped draw 90,000 fans -- the most ever for a sporting event -- and boxing's first million-dollar gate. Radio covered the bout live -- a broadcasting first. The fight itself proceeded like most of Dempsey's title defenses. He beat Carpentier senseless. 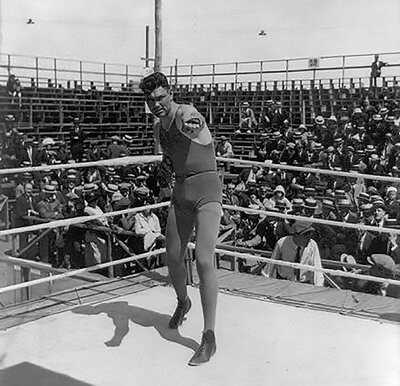 For three years in the mid-1920s, Dempsey fought only exhibition matches, and appeared on vaudeville and in feature films. 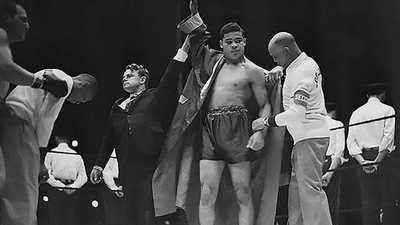 He was scheduled to fight Harry Wills, "The Black Panther," but Dempsey avoided the fight (Joe Louis' managers and others thought he didn't want to lose to a black man) and he was banned from boxing in New York State. In 1926, Dempsey met white boxer Gene Tunney in a challenge to his title. Tunney was a veteran Marine who boxed strategically and read avidly -- but fight fans were rooting for Dempsey. Afterward, explaining the ten-round decision for Tunney to his wife, Dempsey said, "Honey, I forgot to duck." The following year, Dempsey made an attempt to regain the title in a rematch that became known as the "Long Count" fight. One hundred and four thousand people brought in a record $2.65 million for the match at Chicago's Soldier Field. Tunney would not engage Dempsey in the latter's boxing style and held the upper hand for the first rounds. In round seven, Dempsey landed a combination that knocked Tunney to the mat. The referee told Dempsey to get to a neutral corner; he said, "I'll stay here." Finally the referee pushed Dempsey into a corner before he began his count. Tunney took all of the "Long Count" before getting back up, and then finished the fight, winning another ten-round decision. Why didn't Dempsey move to the neutral corner? "I couldn't move. I just couldn't. I wanted Tunney to get up. I wanted to kill the S.O.B." Dempsey retired after the second Tunney fight. His dignity in defeat won him new admirers. After losing his fortune in the stock market crash, he opened a restaurant in New York. During World War II he served in the Coast Guard. Most of the time he worked in and around the boxing ring. Max Schmeling credited a film of the Dempsey-Carpentier fight for sparking his career in boxing. He first met his idol in 1925, when Dempsey came to Europe on his honeymoon. The champ got in the ring with a few young fighters, including Schmeling. Dempsey told Max that he was a future champion; reminded of this comment years later, Dempsey laughed and said, "That's what I told all the young boxers I met back then." A retired Dempsey visited Schmeling again in 1933 to promote a boxing match and they sparred a bit for the press. The two men shared an uncanny physical resemblance. Schmeling expected a loose practice session, but "Dempsey stormed over to me -- as he would have in his prime -- and decked me." Schmeling fought back and Dempsey laughed off the situation. Dempsey remained close to the boxing world and was present at both Louis-Schmeling fights, commenting that he was glad never to have faced Louis in the ring. When Louis' financial problems became public, Dempsey served as honorary chairman of a fund to help the Brown Bomber. Jack Dempsey died in 1983. 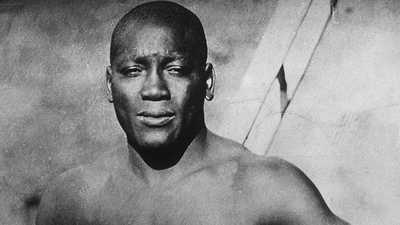 As one of the toughest boxers who ever lived and the first black heavyweight champion, Johnson stirred up controversy. Roxborough appeared to Louis as "well encased in dignity and legitimacy." Roxborough saw in Louis the chance to make big money.